I’m sitting at my desk and I realize that my lower abdomen is hurting. Even though I know the exact reason why, I still mentally tick through my rolodex of reasons: Is my cycle getting ready to start, when’s the last time I had a bowel movement, am I ovulating? NO, it’s the beginning of a UTI and NO I don’t need a UA C&S to figure out what the bacteria is or why I have one. We don’t go to the bathroom. We don’t drink enough fluids unless they’re chock full of caffeine.We also stand up and eat lunches that are at the wrong temperatures or even worse from a vending machine, we forget to arrange for pickup for our children, and more than likely the only reason why we have had a recent check up is because we need Xanax to work long hours at an often thankless job providing care for other people. Nurses don’t often take care of themselves but if you call us at four am we will triage your symptoms and recommend that you see your primary in the morning. Sometimes I schedule bathroom breaks on my phone. When the alarm sounds I have to go to the bathroom, no matter what. Sometimes this works. 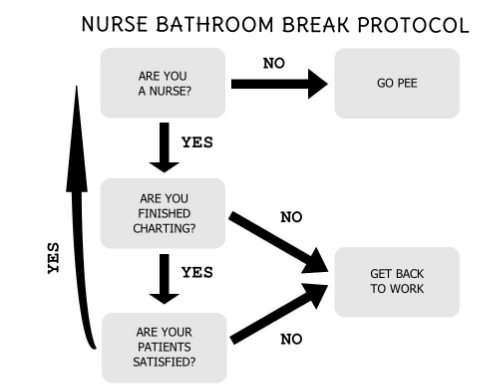 There’s this thought process that nurses have larger bladders than other people and while there does seem to be some truth to this, I’ve taken care of plenty of young nurses who have incontinence issues. The bladder is a balloon. You can only stretch and abuse it for so long before it stops functioning correctly. We have to get to the point where we understand that we can’t take care of others if we don’t take care of ourselves. And with that being said please, go to the bathroom, NOW. This was hilarious! Lol..Self care is everything…especially when u r taking care of everyone else. Good read!